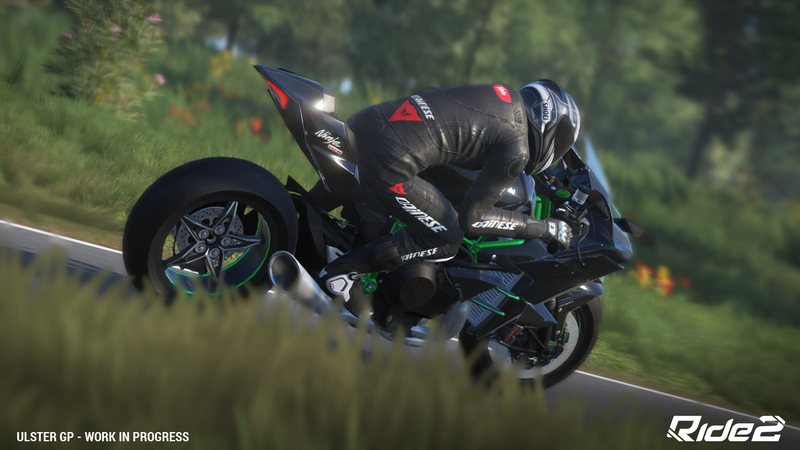 When I reviewed Ride back in October 2015, I wrote, "This spiritual successor to Tourist Trophy delivers exciting and challenging racing action that's thoroughly enjoyable. However, graphics that feel more last generation than this, rather weak sound, and very slow loading times take the edge off the overall experience." Despite that criticism, I concluded that I hoped Italian developer Milestone would produce a sequel, as I was keen to see how the game would evolve given a second chance. 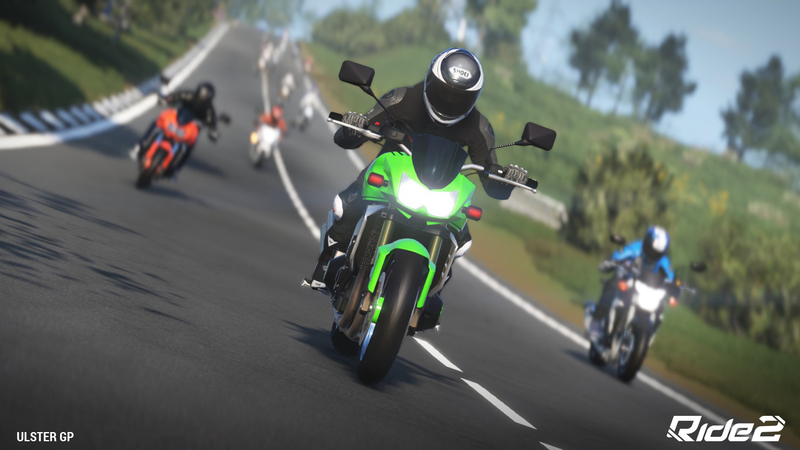 Fortunately, they did, and the results of their efforts is Ride 2, another pure motorcycle racing game that offers significantly more bikes, tracks, and races than its predecessor. It certainly sounds promising on paper, but to be blunt, my initial encounters with the game weren't too positive. As I reported in yesterday's Starting Screen Racing Games Update, which I wrote last Friday, I was feeling disappointed with what I'd experienced up to that point, and here's why. When you start Ride 2, you're given a choice of four motorcycles. I selected the KTM 690 Duke, a naked middleweight bike that I've been a fan of for some time. The problem is that it's really underpowered for the races that it's eligible for, resulting in me repeatedly losing as I sought to earn enough money to upgrade it and make it more competitive. The process was slow and somewhat frustrating – I'd overtake other riders by out-cornering them, but then they'd reel me in on the straights and fly past me with their more powerful bikes. Something else that was also irritating me was the meager sum of in-game currency that's doled out for winning races. That, coupled with the considerable expense of purchasing new motorcycles resulted in progression feeling very slow – almost like a grind. And that's when I wrote my update which, as it turns out, was pretty much when my feelings about the game were at their worst. As I continued to put time into Ride 2 over this weekend, things began to pick up almost immediately. I realized I could afford a 125 cc bike, and purchased a highly competitive Aprilia RS 125 R, which I was able to use to win several races in a row. That resulted in me unlocking an invitational contest that I also won – earning me an absolutely brilliant Bimota Tesi Naked, and a significant cash reward. Using my newly-gotten gains, I was then able to splurge on an Aprilia SXV 450, which enabled me to compete in supermoto racing and swell my coffers even further. Finally, I felt like I was properly making progress. The thing is, the structure of the game is actually really good once it gets going. There are four basic categories of racing – Urban Style, Street Icons, Hyper Sport, and Pro Racing. Each one comprises four to eight different classes of races, such as naked, heritage, or sports, and each class features its own series of individual events. At first, you're limited to competing in whichever events your starting motorcycle qualifies you to enter, but once you're over that frustrating starting hump and begin to earn money and new bikes, you unlock new, more challenging classes of races, as well as the aforementioned invitational contests, where big money and highly desirable prize bikes are up for grabs. And this is where the game starts to become really entertaining. Ride 2 features more than 200 bikes from pretty much every major motorcycle manufacturer you can think of, from top marques like Bimota and Ducati to stalwarts such as Honda and Suzuki. It's a really impressive roster that incorporates a broad array of bike classes, including oldschool two-strokes, modern 125's, middle-to-heavyweight sports and naked bikes, superbikes, and thoroughbred racers. There are even electric bikes, café racers, and supermotos. It's a heady mix that ensures the racing is varied and interesting. The game's track list is also very diverse. It features a trio of dedicated supermoto courses, three drag strips, ten GP rings, eight road-based tracks, three city courses, and three Road Race circuits. The latter includes the iconic Nurburgring Nordschleife, and the huge Ulster GP course. Combine all those tracks with the different bike classes, and you have a smorgasbord of two-wheeled racing. Especially when you consider that there are a variety of different racing events to participate in, including drag races, time attacks, overtaking and rivals challenges, regular and endurance races, team races, and even championships. Of course, all this would be worthless if Ride 2 wasn't fun to play, but fortunately it is. 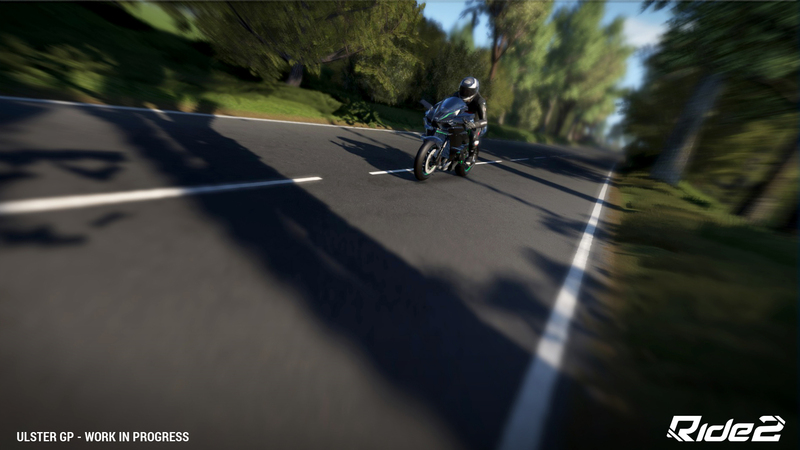 Speaking as a motorcycle rider, I always find it difficult to think of motorcycle racing games as anything other than arcadey, and Ride 2 very much feels that way. It seems to be tuned to be forgiving and fun, allowing you to explore the outer edges of a bike's handling without having it spit you off in anger. Motorcycles have a nice weight to them as you deftly flick them from side to side, and the throttle response is nicely progressive, enabling you to pull wheelies with higher-powered bikes as you lay on the gas coming out of a corner. Indeed, some of the more powerful cycles are quite a handful, and their absolutely blistering speed takes some getting used to. But again, it's all within fairly forgiving parameters, and you have to do some pretty silly things to end up sliding down the road. Even if that does happen, there's no need to worry. Fortunately the game features a rewind option that enables you to undo a mistake at the touch of a button. There's no penalty for using it, other than your current lap time being invalidated, but that's a small price to pay for a potentially race-winning save. Sometimes it feels like cheating, but what can I say? If you don't like it, you can always turn it off. While the racing is generally very good, Ride 2 is a little weak in the audio-visuals department. The graphics are fine, but certainly not on par with class leader Forza Motorsport 6. 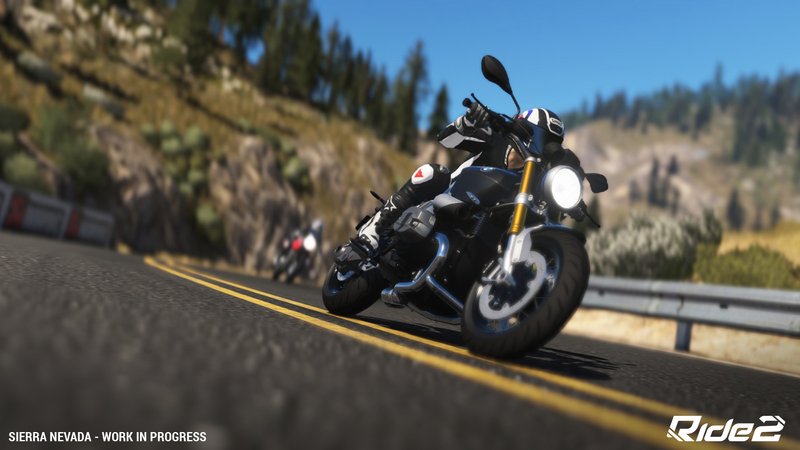 The motorcycles and riders are beautifully rendered, but the tracks and landscaping lack the kind of graphical finesse to really bring them to life. Instead, the game's world feels somewhat inert and lacking atmospheric depth. The devil is in the details, such as the crowd that looks a little last-generation, the rather flat lighting, and the fact that sometimes the bikes don't feel fully anchored to the road, needing deeper shadows to help connect them to the asphalt. Sound is decent, but not outstanding. The game does feature quite convincing engine effects, but they’re a little inconsistent. I like the scream of the GP bikes, and the 125's sound spot-on, but some of the single- and two-cylinder bikes lack the kind of throaty throb that I associate with that type of engine. They just don't quite have a feeling of oomph about them. Despite that, I still really like Ride 2. Its AI is good enough to put up a stiff challenge, and it has deep customization options that enable you to buy all sorts of new gear for your avatar, as well as define his or her own personal riding style. The action does start out slowly, and the first few hours playing the game do feel like a bit of a grind, but once you crest that starting hump, Ride 2 becomes a really enjoyable racing experience. Of course, I'm speaking very much from the point of view of someone who loves these kinds of games, so take that as you will. But I think Ride 2 is the best two-wheeled racer around. Of course, it's pretty much the only one too – but fortunately it's solid enough to be well worth recommending. A bit clunky and oldschool, and loading times are a little slow, but it's serviceable enough. 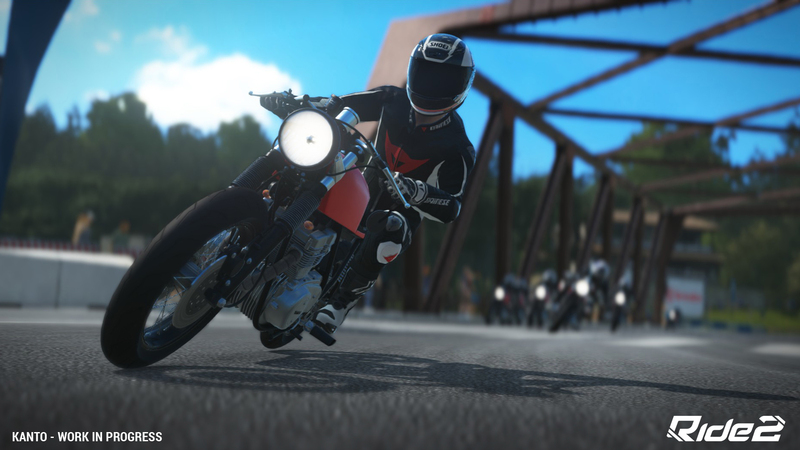 Ride 2 offers a smorgasbord of racing, giving dedicated players plenty of long-term appeal. Some bikes sound spot-on, whereas others seem a little flatulent and lacking oomph. Ride 2 looks good, but not great. The bikes and riders are very nicely rendered, but the tracks and landscaping feel a little inert.